The weather played havoc with plans to sail a Strand Bay Race at Townsville Yacht Club’s SeaLink Magnetic Island Race Week today, but Principal Race Officer Denis Thompson and his team had a trick or two up their sleeves, and so the locals did not miss out. Originally, racing was due to start at 11am, but the key ingredient was missing – wind. Thompson, his team, the fleet and spectators waited patiently on a glorious first day of spring, and were rewarded. The first whispers of breeze filtered through, by which time Thompson had moved the start closer to The Strand in Townsville – and at 12.40pm, the IRC boats were away, followed by each of the other divisions. Those ashore got a view of boats heading towards them, some flying Code Zeros, others under spinnaker, but as the breeze transitioned, spinnakers were flying from all directions, making quite a spectacle. By 1.45pm, the breeze filled in nicely, giving competitors a great second half of racing. Paul Clitheroe’s TP52 Balance (NSW) and William Goodfellow’s RP52, Miss Scarlet (New Zealand), matched raced around the course as photography enthusiasts ashore snapped away. The smaller Vamp, a Corby 49 owned by David Fuller (NSW) may have been left behind at the start, but his crew new what they were doing and made it two wins from two races. Fuller, a past commodore of the Cruising Yacht Club of Australia, takes up the story: “The breeze came in and to us at the right time and we hit the breeze transitions at the right time too. I’m starting to think it doesn’t pay to get a good start,” he said laughing. Tasmania’s Hughie Lewis, who is skippering the Victorian modified Farr 40, Ponyo here, also came ashore smiling. 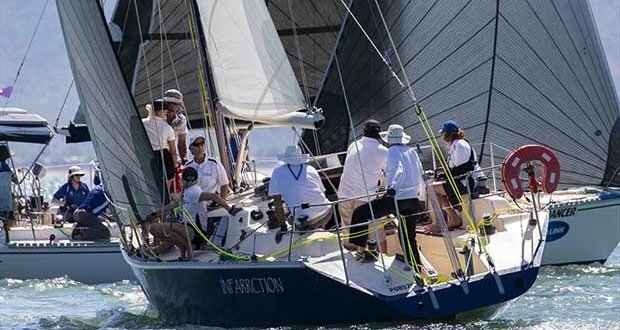 He won SeaLink Spinnaker Division 4 from sailmaker Ian Macdiarmid’s F6 Razer, Hellrazer (NSW). “It was good that Denis (Thompson) did what he did by shortening the course and starting it nearer The Strand. We started well and got through the two breeze transitions well. Then it was a reach to the finish – the course suited us. Having said that, Denis made it fair for all,” Lewis said. All were happy aboard Michael Phillips’ Poppy too, because the Gibsea Master 44.2 design, based at Magnetic Island, took line honours in the Non-Spinnaker Division. “An interesting day,” Phillips, from country South Australia said. “The committee did the right thing starting the race near The Strand to give the people onshore what they were promised,” he said. 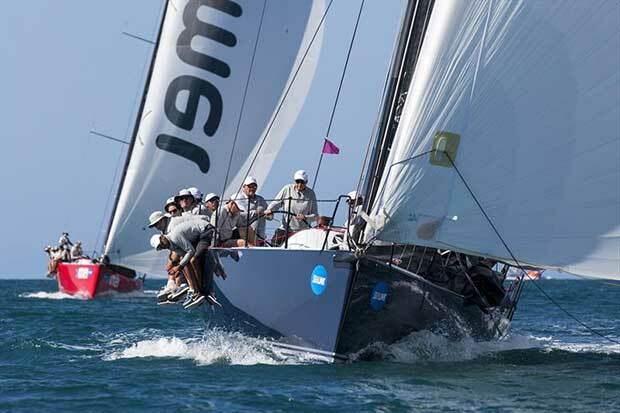 “We timed our start to perfection and got off the start in clean air and sailed well. It was a tactical race. The wind was light and fluky and then we had a little more pressure, but the wind was shifty,” he explained. Earlier in the day, a stowaway was found on board in the form of Elvis. “We had to take him off the boat for two reasons – he wasn’t on the crew list, so we could have been disqualified – and we didn’t want him outshining us either,” said one of Poppy’s crew who sent Elvis ashore early to entertain everyone on the deck. Phillips and crew will celebrate Poppy’s 15th birthday next Wednesday. “She still performs very well against the modern boats,” he said proudly. Racing continues on Monday, and in the meantime, competitors have a fun-packed lay day ahead of them.